Have you ever wondered what God might do with the passions He’s put in your heart? Ponder this question with me, life coach Cynthia Culver, and Devoted Dreamers listener Lois Martin in this second of three bonus On-Air Coaching calls. In this episode, Cynthia’s questions focus on the DIRECTION component of coaching. Cynthia touches on the Session II homework here, too. It’s focused on helping you understand the mindset of truth, which is all the ways you think when you choose to operate out of God’s word and His truth instead from your fear or your broken mindset. Session II - Direction: Evaluate current results and establish new and clear direction. As you listen to Cynthia’s questions and hear Lois talk about her challenges, I hope you can keep an ear toward your own story, passions, and specifically the dream God has put on your heart to contribute to His Kingdom. Come back next week to listen to Session III on Development. I’m on maternity leave for the summer of 2018, but I’d love to hear your feedback on these On-Air Coaching calls. Leave me a message via my Contact page and let me know your thoughts. By the way, if you’ve already requested access to the Broken Mindset Worksheet from Session I, you’ll automatically receive the homework for Session II one week after receiving the first email. Put on the full armor of God, so that you can take your stand against the devil's schemes. 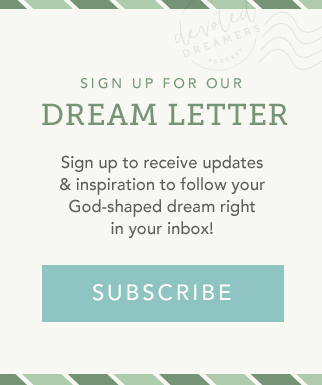 Get More Involved...Become a Devoted Dreamers Patron. 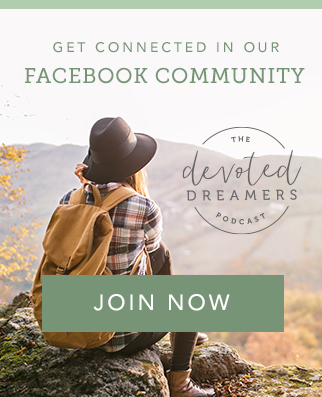 Your support enables me to continue providing inspirational content and interviews each week from dreamers, just like you!